As you know, I'm trying to switch my blog over to Wordpress... http://susannahill.com/blog/ ...but there are (possibly insurmountable) issues, including the fact that I can't get a link list to appear over there. So for today at least, I'm posting here as well so you can all add your links, and I'm going to try to add them manually to my post over there... I just won't get it done until late in the day or evening... and I wanted you to have visitors before that! Outside, a mean wind blows. Icicles hang from the windowsills. Inside, Pauline presses her nose to the frosted glass. "Let's have a lemonade stand."" 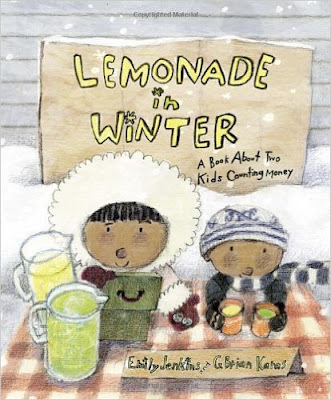 Brief Synopsis: Undeterred by the wintry weather, Pauline and her little brother John-John gather up all their quarters, buy supplies, and set up a lemonade stand. Alas, customers are few and far between, forcing Pauline and John-John to be creative to try to increase sales. In spite of their best efforts, they spend more than they earn... but they earn enough for something that pleases them both. Links To Resources: the book itself is a resource in terms of showing creative business management :) - Pauline and John-John try advertising, sales, decorations, and entertainment. It also shows money and math in action, and there is back matter in which "Pauline Explains Money To John-John." Ask your child or students to think up their own business ideas. What would they sell? How would they go about it? What supplies would they need? How much would they need to charge and how much would they need to earn to make their business a success?